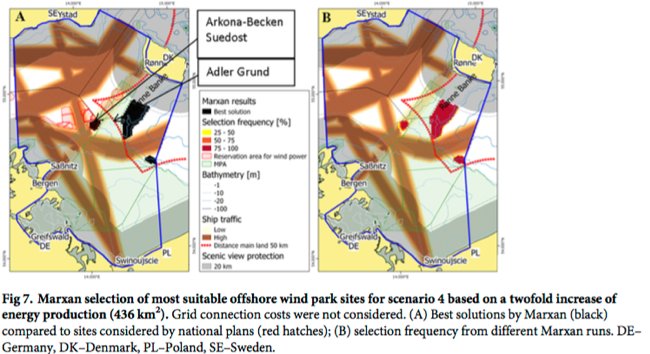 The study uses Marxan, (a decision support tool for mostly used in conservation planning) to optimize algorithms to find the most cost-efficient site selection suitable for offshore wind farm installations in Germany, Sweden, Poland and Denmark. The main objective for applying Marxan was to test the usefulness and reliability of a systematic decision support system for a specific MSP challenge other than conservation (in this case cross-border MSP) to analyse the potential for offshore wind power for different cost and target scenarios. This study covers work done in the BaltSeaPlan as well as BaltSPACE projects. Which tools can be used to determine and select potential areas for offshore wind energy installations? The study was undertaken as a case study that formed part of the Interreg BaltSeaPlan project. 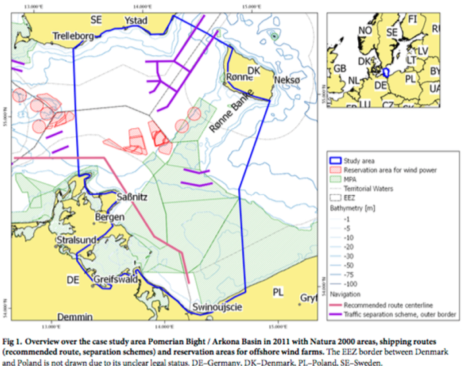 Although the scope of the study took place outside the formal MSP process, the results from the study were incorporated into the planning process of the Arkona/Pomeranian Bight in the western Baltic of a two-year planning period. 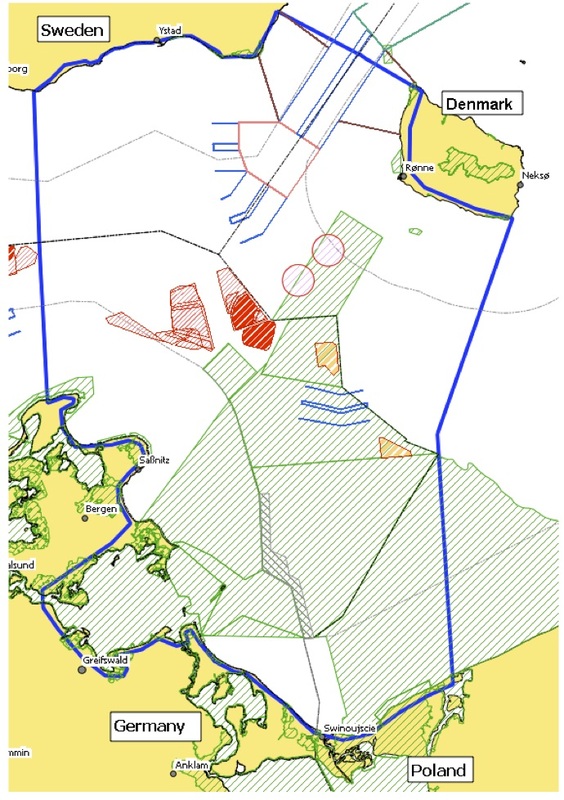 The objectives and targets for the installation, as well as the application of Marxan were based on previous experiences published in the Danish strategy for future offshore wind power sites. The objective of the study was to identify cost effective areas for potential wind energy installations while addressing issues of conflicts of uses (shipping, biodiversity conservation, etc.) and incorporating cross-border MSP. The main objective for applying Marxan was to test the usefulness and reliability of a systematic decision support system for a specific MSP challenge other than conservation (in this case cross-border MSP) to analyse the potential for offshore wind power for different cost and target scenarios. Marxan was applied to find suitable sites for the production of a specific amount of wind energy per country, based on availability and cost for foundation and cable connections (as part of construction cost). This study defines cost to include construction cost as well as cost associated with conflicting features (conflicts with shipping and ecological features) and the visual disturbances associated with tourism. The Marxan setup involved the combination of study objectives and set standards to meet user defined targets (Equation 1). FPF (Feature Penalty Factor) = Penalty factor for not reaching the target for the feature. Monetary cost components (construction cost) were summed up per Planning Unit (PU) whereas non-monetary costs (conflict cost associated with tourism, shipping and ecological features) were then defined set monetary terms to achieve an adequate impact. The process followed and adopted the Danish Energy Authority’s recommendations of small sized windmills and possible spacing results in similar technical production capacity. The Marxan algorithm utilizes iteration to optimize Eq. 1, which includes a random selection of planning units, therefore creating different results for each time the system is run and setting the basis for selecting a frequency for the single planning units. Selection frequencies of +50% are considered significant solutions, of which the solution which minimizes Eq.1 is regarded as the “best solution”. The number of iterations was set at 10^6. Target features were defined by a combination of both a percentage of each country’s territorial waters and EEZ and the mean wind speeds to find suitable solutions for high energy production. 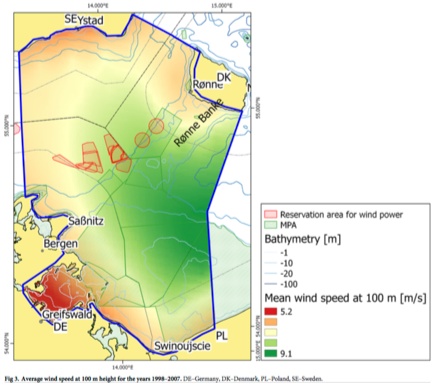 Mean wind speeds between 1998 to 2007 at a height of 100m were obtained from the Interreg IIIa project POWER and modelled using the UMPL (Unified Model for PoLand Area) model v4.5 at 9nm resolution. Two available data points based on energy production of 3900 and 4300 full load hours of mean speeds 9.4 ms-1 and 10.3 ms-1 respectively, as well as possible energy production, were estimated as a linear relation. Targets were then normalized to a maximum value of 165 UMPL. Cost layers comprised of construction cost and conflicting measures. Only construction costs that varied due to geographical differences of sites were considered, whereas foundation costs (defined per MW) were estimated based on existing facilities. The sets of these two types of costs factor into each other, therefore a wind park size of 44km2 or 200MW was assumed in all scenarios. Four scenarios with different target and cost settings were analysed. Scenario 1 served as the reference point upon which scenarios 2 and 3 were developed by estimating the influence of an increased wind energy demand on site selection, using double and threefold targets. The last scenario was used to demonstrate differences in selecting suitable areas when cable connection costs to existing land-based electrical stations are neglected. 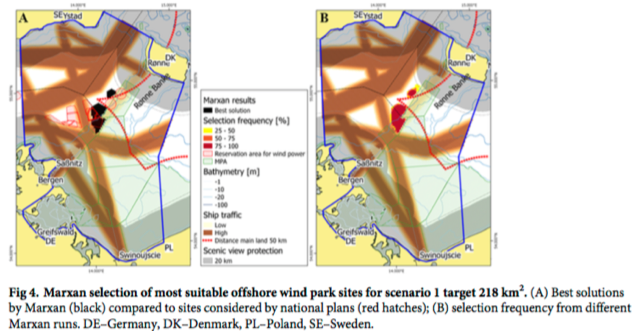 Aside from scenario 1, targets in all other scenarios were not divided into country targets to investigate an optimal solution for offshore wind power development within an international transboundary area. Based on proposed offshore wind energy demands, the potential outputs included cost-effective installation areas based on a combination of different national site characteristics, costs, available wind speed and existing installations, among other factors. This resulted in 4 scenarios for selection of most suitable offshore wind parks in Germany, Denmark, Poland and Sweden. Both the tool and methods used can be replicated and applied to other areas. The Equation, given the necessary data inputs are available, can also be used and replicated for similar studies with Marxan or other identical tools.